The good news is that it’s my favorite time of the year. I call it baking season; the season of bake-offs, Halloween, Thanksgiving, Christmas and all things sweet! The sweet aroma of cookies baking and pumpkin cinnamon spice filling my home brings me more joy than you’ll ever know. 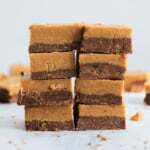 I’m so excited to share with you a FABULOUS new pumpkin recipe in partnership with my friends over at Nuts.com: Pumpkin Paleo Brownies made with their almond flour and coconut flour. Who knew that Nuts.com sold more than just nuts?! Not me, however now that I do, I LOVE it! Their bags are BIG and come shipped straight to your door. In my personal opinion, it’s way better than buying small bags of expensive almond flour at your local grocer. Now that you’ve gotten your Nuts.com fix, I’m sure you’ll be using it all the time. It’s a great way to stock up, especially before the holidays arrive! 135 calories for a BIG brownie you can feel good about eating. 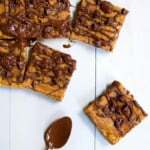 Real ingredients and no unrefined sweeteners make these the perfect afternoon treat. Especially for the kiddos! The pumpkin adds moisture, fiber & vitamin A to the brownies! There’s no pumpkin spice so there’s no room for pumpkin spice haters. To be honest, these brownies aren’t overly pumpkin-y either, just delish. They are fudgy. Tony told me these brownies tasted rich and that I should call them rich fudge brownies. While that name is adorable, I didn’t want you guys to think these were heavy. However, they do taste very fudge-like. YUM. Alright enough chatter. Let’s get baked with these pumpkin paleo brownies! I love these at room temperature with a BIG glass of almond milk. Fudgy pumpkin paleo brownies made with maple syrup, coconut flour and almond flour! These easy, one bowl healthy brownies are the ultimate fall treat. Preheat oven to 350 degrees F. Line a 8x8 inch pan with parchment paper. In a large bowl, mix together pumpkin puree, maple syrup, eggs, vanilla extract until smooth. Mix in the dry ingredients: almond flour, coconut flour, cocoa powder, baking soda, cinnamon, allspice and salt until smooth. Fold in 1/3 cup chocolate chips. Add batter into prepared pan and spread to the edges. Smooth top with a spatula. Bake for 20-25 minutes until knife comes out clean. Brownies will not look completely cooked but as soon as the knife comes out clean, they will be done. Cool on a wire rack for 15 minutes. Make the topping by melting chocolate chips and coconut oil in a small saucepan over very low heat. 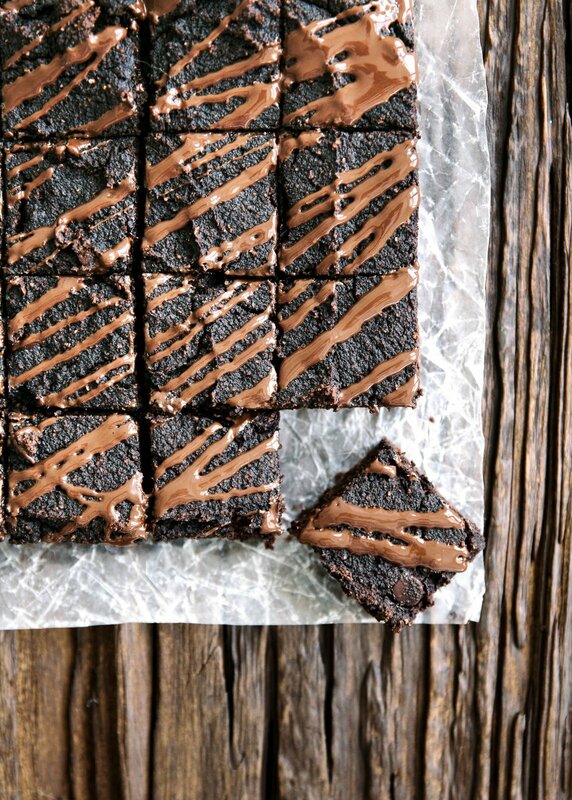 Drizzle over the top of the brownies then cut into 12 squares. I LOVE eating these brownies cold, so do yourself a favor and once they've cooled put them in the fridge. How to store: Brownies can be kept at room temperature in a container for 1 day. After that they should be kept in the fridge (they are actually really good cold!). TO MAKE VEGAN: You can try using one or two flax eggs (2 tablespoons flaxseed meal + 6 tablespoons of water mixed together). I think it would work well, but please know I have not tested a vegan version. Want to make these less sweet? Reduce the maple syrup to 1/4 cup! Instead of maple syrup, feel free to use coconut sugar or organic sugar. I would recommend using 1/2 cup. If you are not vegan, you can use honey, although I find that honey can overpowers the cocoa flavor, so I would not recommend it. This post is in partnership with Nuts.com, a brand I trust. Thanks for supporting AK and the brands that help make this site possible! 73 Responses to "One-Bowl Fudgy Pumpkin Paleo Brownies"
These brownies look incredibly fudgey and chocolately! Only 135 calories each? DROOLING! lol at Tony’s name idea. My husband wanted me to name a cookie bar recipe “Brownie Boyfriend Pleasers” …boys are the best. I can’t wait to try these! This is the first time I’m seeing this recipe and I have been wishing for a good Paleo dessert!! You caught my attention just with the title – fudgy, pumpkin, AND brownie? I’m drooling! 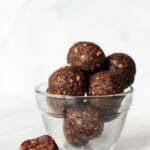 These were super easy to makes and healthy, but just not sweet enough for me! Hi! I wanted to come back and say that I tried a 2nd brownie and this time the piece had chocolate chips in it which helped the flavor a lot. My suggestion would be to increase the chocolate chips to 1/3 cup BC without them it’s not sweet at all, but with them it’s a good treat! 2nd, make sure you really incorporate the chocolate chips throughout the whole mixture so you do get that extra sweetness in each piece. ? That’s odd that you didn’t find them sweet enough, even with 1/3 cup maple syrup and nearly 10g sugar per brownie. I’m wondering if you’re maple syrup was Grade A or Grade B? With Grade B, you get a richer flavor and more sweetness; just an FYI for the future! I also love the idea of adding a few more tablespoons of chocolate chips to the batter. Mini chocolate chips might be a great idea too! 🙂 Thanks for making them! I’m thinking maybe my maple syrup wasn’t the right kind. Im going to try them again and make sure that I use the kind of syrup you suggested because your recipes are always so good, and I was confused as to why this didn’t seem sweet enough haha. Thanks for getting back to me and the suggestion! I always love your posts! 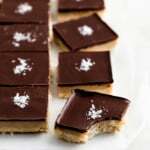 So, I had planned to make another batch of your Coconut flour bars (LOVE them) but I saw this recipe this morning and decided to switch it up. I love these too! I reduced the maple syrup to 1/4 cup like you suggested because I tend to like things a little less sweet, and they were just right!! Thanks for another great recipe! I’m so glad you liked them! <3 Happy baking. These look so moist and delicious! I can’t wait to make them! 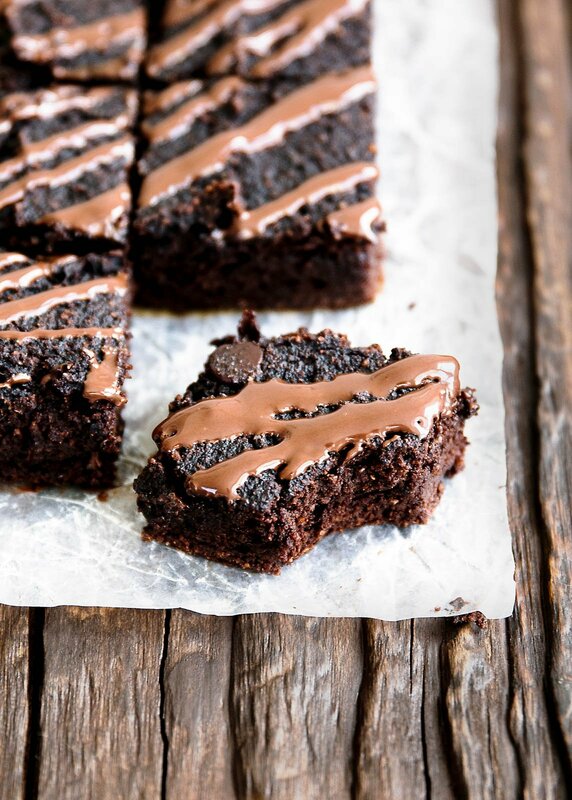 These brownies look super tasty! And pumpkin just in time for Halloween. These were the best brownies I have ever made! I made these and followed the recipe exactly, it was perfect. The chocolate sauce was also amazing! I served with vanilla gelato and raspberries, and had extra sauce so drizzled it over the gelato and it tasted like a dipped cone from dairy queen! I love your recipes Monique, thanks again.These were a hit with my company yesterday evening. Hi Monique, can’t wait to try these recipe, If I do it today, I will post results on my instagram account.and give you credit of course, @girllovesdessert. Have a wonderful day. I made these yesterday and loved them! I upped the amount of chocolate chips so they were extra rich. I’d love to see more paleo/low carb high protein treats! I also made your almond protein chocolate chip cookies and thought they were amazing! Thanks for all the healthy treat recipes – makes me feel a lot less guilty about having a treat once in a while :). My daughter is allergic to nuts… can I replace the almond flour with an all-purpose gluten free flour? thanks for another pumpkin recipe, looking to puree all of my carved pumpkins into something fun and tasty, these look great! you’ve inspired me to take a crack at my very first gluten-free batch of homemade brownies. In the past, I’ve tried mixes, but I don’t like all the additives that come along with a pre-made mix, and I just found out I’m allergic to guar gum and to sunflowers, which are both fairly prevalent in gluten-free baking mixes. I also am working hard to eliminate soy and – wherever possible – gluten from my kids’ diet. I substituted Wholesome Agave for the maple syrup and added extra dark choclate chips from Pescha, allergy-free, of course. They look yummy! I wish I could try some, but I’m halfway through the Candida protocol….after the holidays I’ll be able to indulge a little bit more. Thank you!! These look delicious! I just measured out all the ingredients and realized I have no parchment 🙁 do you think aluminum foil would work? I cannot have almond flour and I’m just learning all the ins and outs of using coconut flour. Can I simply replace the almond flour with coconut flour? Thanks! You may have already figured this out by now, but if anyone else is perusing the comment section for the answer, I hope this helps! Coconut flour is highly absorbent, meaning it would make for a very different texture than the almond flour, which isn’t very absorbent. I don’t think it would make for a very nice brownie. You could try rice flour, although I’m not sure how the texture would be as I haven’t tried it, sorry! These were great, thank you! I was going to a gathering where 2 people were seriously gluten-free, and wanted to make brownies because they are kind of easy. This was perfect because I didn’t have enough butter on hand for most brownie recipes. Oh if this applies to anyone else: you didn’t mention whether your cocoa powder was natural or dutch-processed. I only had the latter, but it worked fine. You could try banana! Or even cook some sweet potato, mash it up, and use that instead! I’ve made these a few times now, and they’re always super delicious! The first time I made this I didn’t have coconut flour, so I used a full cup of almond flour which worked out fine for me. This last time I made them vegan, using 2tbspn of chia soaked in 6tbspn of water for 5 minutes. They worked just as well! I also substituted the choc chips for chopped dates, and this was delicious as well! And I added cinnamon which I always find makes brownies extra special and delicious. So happy you like this!! I just made these oh a whim because I found pumpkin purée. WOW! Best paleo brownies ever. I agree maple syrup is far better than honey in brownies as it has a weird aftertaste. I’m definitely going to make these again! Hi! I’d love to try these but I cannot digest coconut flour. What would you suggest as a substitute? Hi Sophie! Coconut flour is super unique because it absorbs a lot of liquid, which means it’s tough to sub it 1:1 with other flours. You could try using another GF flour, but know that the texture will be different! Made these today and I really like them a lot! So easy and quick to whip up! I always love things like this the day after once they have sat in the fridge, I feel like they get fudgyer and yummier! So I extra cant wait for tomorrow!!! They are in the oven right now and I misread and put 3/4 cup almond BUTTER instead of flour. Duh. Will they ever go solid or maybe I just have some pudding on my hands:) Would love your thoughts. I wouldn’t recommend this recipe for cookies, but these and these brownie-like cookie recipes are also delicious! 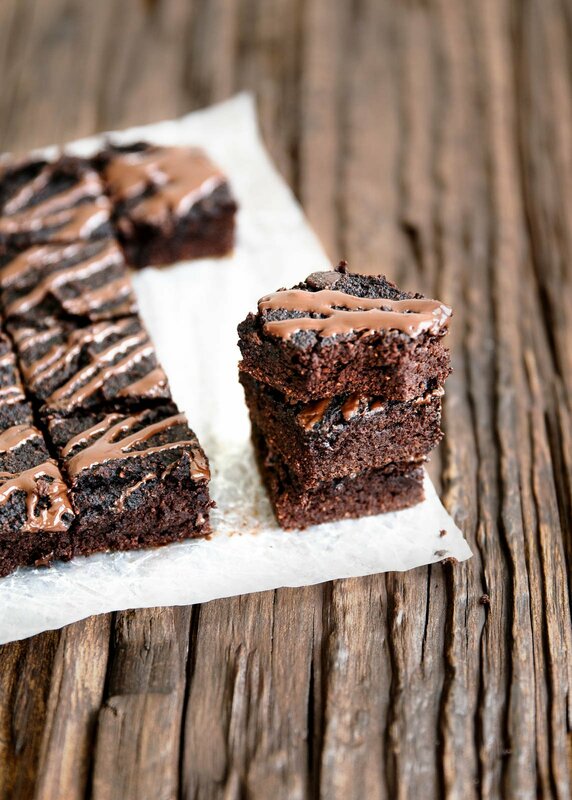 Wow, I really need to make these brownies! I’m not a big fan of baking with pumpkin, but my oh my all this chocolate makes them look way too good! I’ll definitely add these to my list! YES the chocolate in here is so, so good! Enjoy! Made these last night, completely cooled them down and stored in the fridge overnight (we have a hot month here in NJ). Absolutely delicious and you’re 100% right – they are better when chilled. I’m making a bigger batch next time… in love. Omg yesss the best way to eat them! We’ve had a hot couple of months here in Chicago too – I’ll have to make a new batch of these. Hi Jenn! I’d make sure the almond flour is actually flour-like so that the brownies bake up with the right consistency. Let me know how it goes! This is the healthiest and most delicious brownie recipe that I’ve found that doesn’t give me a crash after eating them. I’ve made them so many times and am going to take them for Thanksgiving today for a GF option as well as the recipe to show them the pure ingredients. So glad I found this website! Happy Thanksgiving! I actually found these not to taste dessert like at all and I don’t have a crazy sweet tooth so I wouldn’t recommend using the less sweet option. Other than that, these are delish! Glad you enjoyed the regular version! Made them again and subbed 2% yogurt for the pumpkin- came out so good!! 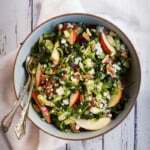 How do I add this recipie to my Pinterest from this site? I like your site, but the jumping videos that cover up your content without request are really annoying!